C’mon, Who Really Wrote it? : James D. Lawrence in 1959. His second of three in a row. Was It Revised? : Yes, in 1973 by Pricilla Baker-Carr. And with that we bid a fond farewell to Ms. Baker-Carr for this was the last book she ever revised. Thank you for your fine work over the years! That means from now on we are dealing with original writing only. No more revisions. 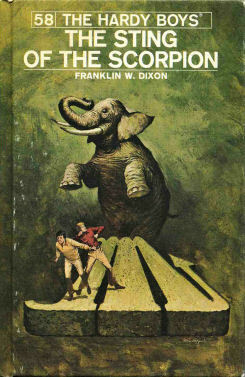 Cover: Rudy Nappi. 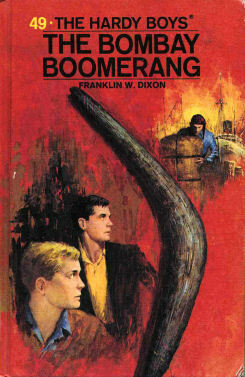 A symbolic cover awash in white and tan, with only Joe’s red upholding the tradition. I like this cover. It has the classic Hollywood movie poster look: one character looks left, one character looks right, the totem pole looks ahead. It’s striking and it’s unique in its subject matter. Setting: Bayport and Alaska with a brief dip into British Columbia. In 1959 Alaska became a state. Mr. Lawrence immediately welcomed the newest state into the crime-ridden world of the Hardys. 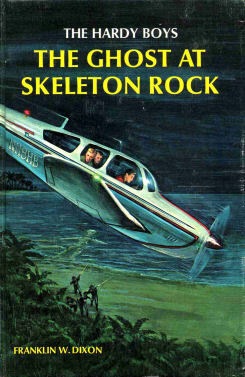 May I once again point out the absurdity of the criminal networks working all over the world, but always having a henchman stationed in Bayport so that the moment the Hardy Boys get a case the henchman can try to kill them to prevent them from traveling to where the crime is occurring. 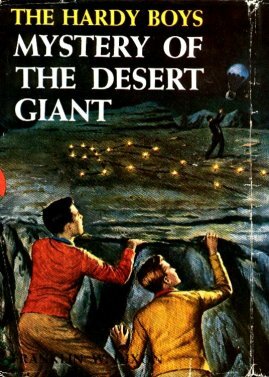 Amazing how all these gangs can always spare someone for Bayport duty, and how that someone can be so attuned to everything that happens to the Hardy Boys that the moment someone gets a phone call or a telegram or even a conversation, that henchman is on the case! Where’s Fenton This Time? : Bayport. The entire stinking time. The Boys are on their own this adventure. Well, not exactly alone. See my review below. Which Chums Show Up? : Chet, Tony, Callie, Iola. Did Mr. Lawrence not like Biff? Aunt Gertrude’s Dessert: Who? She barely shows up. I think Mr. Lawrence was more into Boys Own Adventure Tales than cooking up goodies from Gertrude. Plot: This is an odd one. 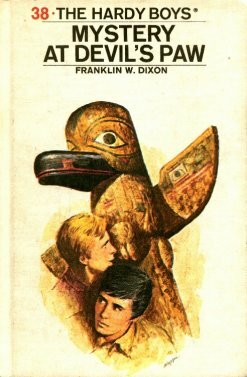 Not too much mystery other than ‘why are the crooks acting this way.’ This is really Frank and Joe Travel to Alaska and meet bears, salmon spawning, locals, indiginous people, totem poles (see cover) and glaciers. The actually mystery of the totem pole is not much. The mystery at Devil’s Paw is not much. The crooks here are not so much crooks, and more folks engaging in foreign espionage. I won’t give it away, but the objective of the bad guys has nothing to do with crime. No, this is less a mystery and more a guide to the Alaskan wilderness. 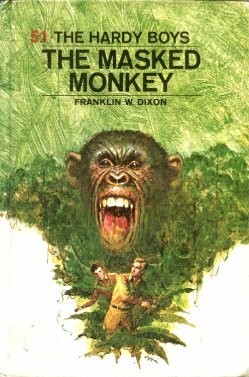 Review: This is not a typical Hardy Boys book, so I’m not as fond of it. In all long-running books or TV series, after a while the writers think, hey, let’s put our characters in Hawaii this week, or something. I’m not fond of these “special” episodes, and that’s what this one felt like. “The first course consisted of slabs of pink salmon, “Good night! It’s raw!” Joe whispered. Welcome to sushi, Joe. Guess that wasn’t much of a thing back in 1959. Holy cow, they finally called in the infantry! That’s some serious firepower at the Boy’s beck and call! Oh well, it’s an OK read. if your child is interested in Alaska or the wilderness, this is his or her book. 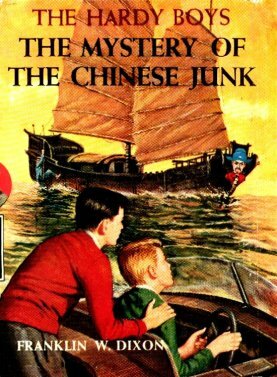 But as a Hardy Boy mystery, eh..